Every Halloween – and a few days before and after – the brilliant star Arcturus sets at the same time and on the same spot on the horizon as the summer sun. What’s more, this star rises at the same time and at the same place on the horizon as the sun does during the dog days of summer. So – around Halloween – it is as if Arcturus is a fainter ghost of the summer sun. At mid-northern latitudes, Arcturus now sets about 2 hours after sunset and rises about 2 hours before sunrise. By watching this star in the October evening chill, you can envision the absent summer sun radiating its extra hours of sunlight. 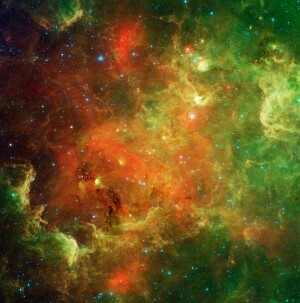 Not till after dark does this star set, an echo of long summer afternoons. Similarly, Arcturus rises in the east before dawn, a phantom reminder of early morning daybreaks. Do not mistake the blazing planet Jupiter for Arcturus at dusk and nightfall. Arcturus sparkles rather low in your western sky, while more brilliant Jupiter shines higher up in the southern sky. 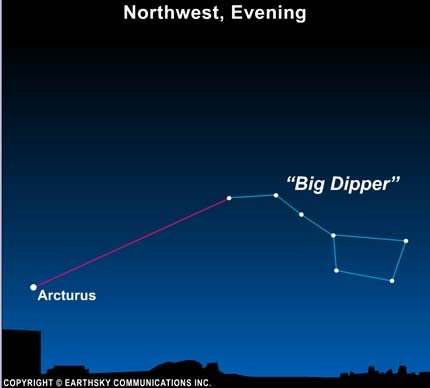 You can verify that you are looking at Arcturus once the Big Dipper comes out. Its handle always points to Arcturus. By the way, if you live as far north as Barrow, Alaska, the star Arcturus shines all night long, mimicking the midnight sun of summer. Site contents copyright © 2019 Recorder Online	except as noted. All rights reserved. | 88 queries in 2.303 seconds.